London Irish will move in as tenants at Brentford FC’s new Community Stadium from the summer of 2020. Irish will end 20 years of playing home matches at Reading’s Madejski Stadium with the move to west London. The 17,250-capacity stadium on Lionel Road near Kew Bridge has also been confirmed as a host venue for the Women’s European Championship in 2021. “In moving we’re confident we’ll attract a larger supporter base to join us,” president Mick Crossan said. Brentford had originally planned to relocate to the Community Stadium in December 2019, but “operational challenges” forced it to be pushed back. “Like us, London Irish has a long history in the area and prides itself on having strong roots in the local community,” Brentford chairman Cliff Crown said. A contract for the Exiles to groundshare in Reading was in place until 2025-26, but a break clause was also inserted to allow them to leave early. The Exiles were granted a rugby licence to play at Brentford in February 2017 by Hounslow Borough Council however, work at the Lionel Road site has been subject to a number of delays since Brentford purchased the 7.6 acres in June 2012. 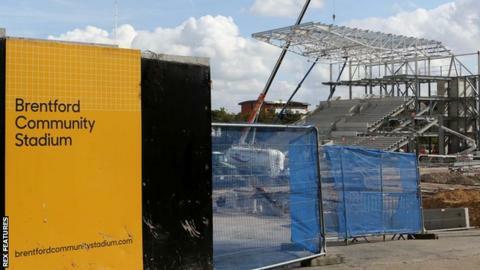 Ground was finally broken in April, which came after Brentford had to submit revised plans for a reduced capacity from the original 20,000. Hounslow Borough Council also had to wait for central government approval to allow a Compulsory Purchase Order (CPO) of some areas of land needed to complete construction. Earlier in December, it was included as one of nine host venues in England’s successful bid for the 2021 Women’s European Championship.